Working to either capitalize or improve on last week's results, the competitors of the O'Reilly Auto Parts Friday Night Drags series congregated on a steamy Georgia night at the Atlanta Motor Speedway drag strip for week 5 competition. One competitor who strongly focused on adding to his points lead was QuikTrip Pro Division driver Kevin Mayo from McDonough. Mayo swept all rounds in his division earning his second straight points win of the season. "Everything was good, I swept all rounds", explained Mayo. "The whole night was very nice." Mayo touched on his strategy to avoid issues at the start, "The main thing was to go in and not turn the red light on. I saw a lot of guys going in and turning on the red light, which gets you disqualified before making a start. I just wanted to sit back and not do that." Mayo's week 2 win has extended his points lead, placing him at the very top of the championship standings. A surprise victory came in the Super Pro Division, as last week's winner, Robert Cheney in his classic 2014 American Dragster faced off against the 1955 Chevy driven by Mike Weaver. As both drivers swept through their competitors, the final faceoff between the two had fans and fellow drivers alike on their feet. Mike Weaver made the run of the night, defeating Cheney in style. "Not much to say really", said Weaver. "I was just determined to beat him [Cheney], so I cranked up the speed to do that." Other notable winners include Courtney Perry from Covington, driving the 1995 Honda Del Sol in the Sport Compact Division. Locust Grove's Dustin Prett took home the trophy in the Street Modified Division, thanks to the muscle in his 1989 Ford Mustang. This week's Peach Pass Burnout Zone Competition zeroed in on the Summit Racing Equipment Sportsman Division. Tonight's victor came from nearby Locust Grove. Nick Blankenship and his Mustang put on a smoke show for the thousands in attendance during the final round of the contest, leaving them cheering for more. 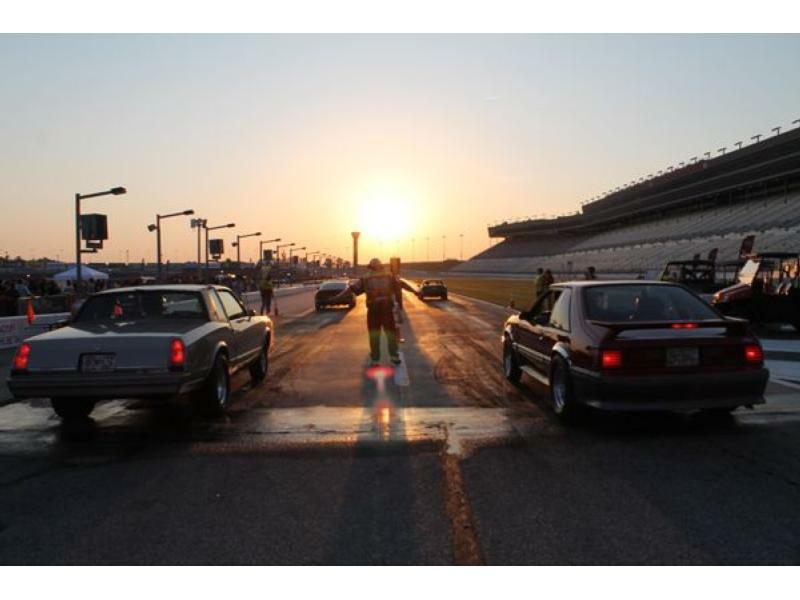 Atlanta Motor Speedway's O'Reilly Auto Parts Friday Night Drags & Show-N-Shine continues with week 6 action on the pit lane drag next Friday, June 22.